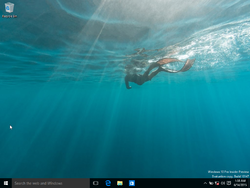 Windows 10 build 10147 is a build of Windows 10. On 2015-06-18, this build leaked onto the Internet. It contains many improvements over build 10130, the latest available public preview build at the time. The desktop UI (the look and feel of the controls, title bars, and desktop applications) has been updated to better suit the overall cohesion of the UX. This is one of the first Windows 10 build known to implement many hallmarks of RTM-style activation. When clean installing, the user might be prompted for a product key twice. Activation appears to carry over when updating. This build is the first to include the Microsoft Edge branding in the new web browser. It also includes a new dark theme for Edge. The taskbar expand button icon has been updated. It also changes the default wallpaper as well. The upgrade setup now reads "Upgrading Windows" instead of "Installing Windows". This page was last edited on 6 March 2019, at 18:16.